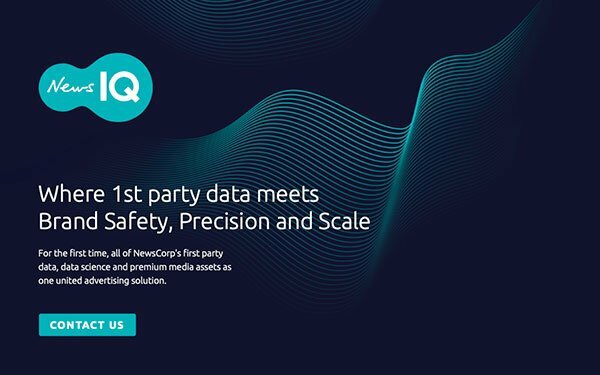 In 2018, News Corp and precision audience targeting platform NewsIQ commissioned a study from Nielsen Media Lab to uncover the power of news websites on consumer behavior and brand perception. The survey found news sites drive a significantly higher increase in purchase intent and recommendation when compared to categories like sports, travel and entertainment. It also showed that news content increases positive brand perception and affinity. NewsIQ itself was launched in 2018, the same year the study was conducted. The platform was developed by News Corp. after its success with News Connect, which launched a few years ago across its Australia properties. News Connect brought together local newspapers, regional hubs and other first-party data. “We faced different challenges here in the U.S. because we’re more silo-ed,” Chris Guenther, senior vice president-global head of programmatic at News Corp, told Publishers Daily. News Corp’s U.S. properties, including the New York Post and its sites, Dow Jones, and even some Harper Collins sites, all had different ad tech stacks and organizations. Building NewsIQ required stitching together each of the disparate sites and adhering to transparency regulations, ensuring the audience is aware of its data-gathering methods. The company created a consistent platform across its business units and built out its own new DMP. Guenther says News Corp’s properties make it a top 10 publisher, per Comscore, offering advertisers an educated and affluent audience. NewsIQ has delivered measurable success with outside clients over the past year, many have signed on for additional campaigns. For example, Guenther cited a project NewsIQ undertook with a large financial services company that wanted to target a high net-worth individual, something generally difficult to achieve. By leveraging first-party data points and its scale across all properties and partnering with another News Corp business unit that created branded content, the campaign was able to surpass expected KPIs and saw success with engagement across content. “Prior to NewsIQ, offering that type of scale and targeting was something we wouldn’t have been able to do,” he said. Matching branded content created by Dow Jones or a bespoke ad unit built by the New York Post team has proved a draw to advertisers.